A dark-scarlet coloured Syrah with a magenta rim and a deep intensity. 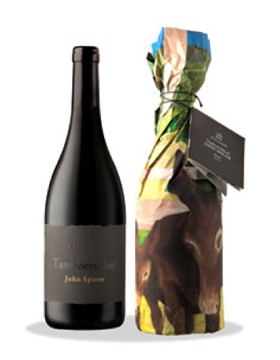 The Kleinood Tamboerskloof John Spicer Syrah is a beautifully structured and balanced wine. The nose develops with medium, but pronounced intensity, showing pure, red and black berry fruit, white pepper, plum preserve and chocolate éclair. On the palate, complex dry spices, loaded with complex plum and mulberry preserve with a white pepper finish. The wine finishes dry with great depth of flavour, elegant structure and firm tannins and a medium plus body. The grapes are handpicked from a select portion of a single vineyard block, hand sorted three times before going into stainless steel fermenters where a combination of state of the art winery technology and old-style winemaking techniques take care of designing this unique, hand crafted wine. Personal food pairing: The wine pairs well with red meat and game flavoured with herbs, berry coulis or smokey spices as well as sweeter dishes of pork, duck or spiced Asian styled dishes accompanied by plum sauces.